With the federal government having just passed a minimum wage bill that will increase the standard minimum wage from $5.15 per hour to $7.25 per hour over the next 2 years, Pennsylvania will reach a new level of $7.15 per hour beginning July 1st this year. This will raise the annual income of a minimum wage earner working 40 hours per week to $14,872, still below the federal poverty level for a family of four, but much better than the $10,712 under the old rate. For informational purposes we have attached the standard collateral from the state government. 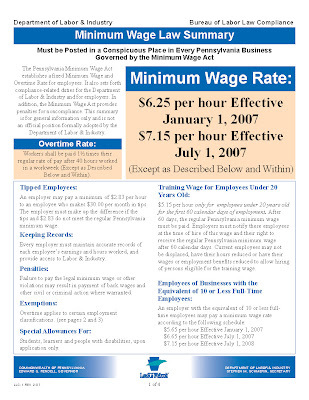 Click here to see the full document from the PA Dept of Labor and Industry (you must have Adobe Reader to view). wages has only helped economies over all.